Over the past couple of years we’ve been auditing web pages. Lots and lots of web pages. A few weeks ago we exceeded 1 million total SEO audits. As we crossed that threshold we decided to mine through our data to try and find interesting patterns with regard to SEO. For this particular article, I am going to show you how to benefit from the most common SEO mistakes. Our audit engine analyzes one web page (or landing page) at a time to see how optimized it is for a target keyword. We do this because we feel it best reflects the behavior of a user searching Google. The user enters one keyword at a time and Google returns the most relevant web pages in the search results, not websites. 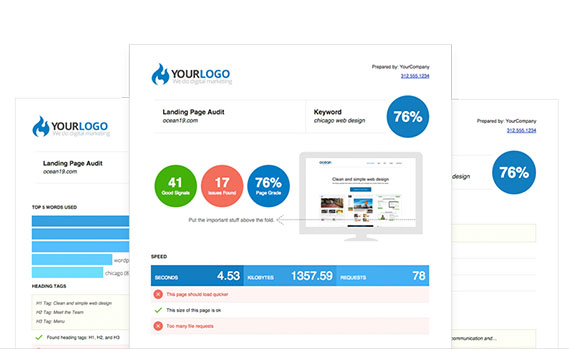 Each landing page audit is generated in less than 30 seconds. Upon completion, the report shows more than 60 correct or incorrect SEO signals. The more correct signals, the better the score. Our SEO signals were selected based on 12+ years of my SEO experience, then cross referenced and checked with some of the best data from the most respected search engine marketing minds from all around the world. For example, among many other resources, we look at data from Moz’s biennial Search Engine Ranking Factors. I’m particularly fond of Moz’s Search Engine Ranking Factors because they collect their information from dozens of experts from all over the world. Referencing resources like this add reassurance to the quality of our in-depth, nine-page SEO audits. We also regularly update our audit engine to best reflect Google algorithm updates. For example, in the spring of 2016 we added an entire page to our reports that focused on mobile SEO signals. This was in response to Google’s major mobile update, referred to by many SEO experts as “Mobilegeddon”. My hope is to help SEO service providers impress more sales prospects through early detection of problematic SEO inefficiencies in web pages. For example: You’re a sales person in Sydney, Australia, and you have a full day of sales meetings and sale prospects to impress. This data will help you know what to look for should you be running late to a sales meeting or put on the spot in a sales meeting. This data will help you quickly look for the most common problematic SEO web page mistakes. There’s more than one way to “skin a cat” in the SEO game. This data will help website owners identify simple wins they can use to sneak up on and beat the competition. Backlinks from popular and unique domains may be the most heavily weighted signal in Google’s ranking algorithm, but it’s not the only signal. There are 200+ ranking signals, and they all add up. Website and business owners can use this data to help them understand the common weaknesses and mistakes on competitor pages. I’ve gotten so many web pages to page #1 of Google search for huge keywords, driving tens of thousands of visitors to websites, with zero time spent on earning links. 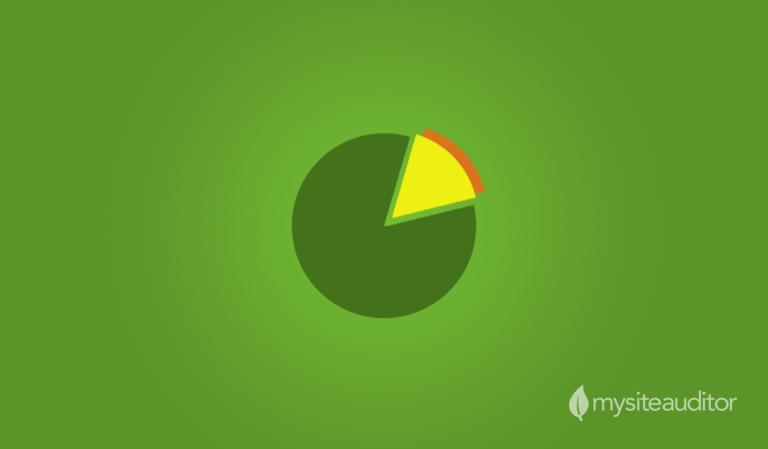 I just focused on the simpler and smaller things you can find in my SEO audits. So use this article wisely and sneak up on the competition. They won’t know what hit them. These are the most common SEO mistakes we found in the web pages we audited. However, before reading please note that Google does not publish their ranking algorithm. Our SEO audit engine was built on experimentation, years of experience, and cross-referenced with some of the best data from the best resources in the world. Only 38% of web pages had the target keyword in the title tag. Because the title tag plays such a big role in SEO, this mistake is worth telling the potential customer about in a sales meeting. Simply point out the problem, and emphasize how important the title tag is to SEO. Having your keyword in your web page’s title tag not only signals Google about the topic and content of your page but it also relays confidence to your target market that clicking on your web page will provide the information they’re looking for. Make this a priority. It should only take a few minutes to fix. 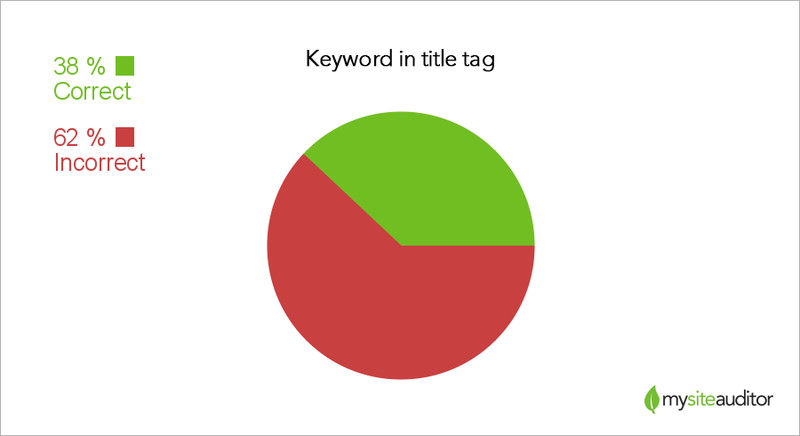 34% of title tags had more than 60 characters. While every detail matters, this signal is not worth mentioning to potential customers in sales meetings. If you do mention the signal, tell your potential customer that using more than 60 characters in the title tag could result in their message being cut off in search engine results pages. Once you hit about 60 characters, Google can truncate your title tag to fit in the search results. Rewrite your title tag over and over until you’re able to clearly communicate your message in 60 characters or less. It should be noted that our recommended character length of title tags is a conservative estimation. Google actually measures the pixel width of the space allotted for title tags and cuts off the rest. Different letters, symbols and capital letters can shorten the amount of characters shown in the space for the title tag. Only 32% of web pages had the target keyword in the description tag. Even thought the description tag plays a big role in CTR on search engine results pages, it does not directly affect rankings. This common mistake isn’t worth focusing on in sales meetings. Simply point out the problem, and move on. On search engine results pages, Google tends to bold keywords in the description tag. Bolded keywords attract the eyes of your target market, helping your CTR. According to our data, just under one third of web pages add their target keyword to the description tag. Because it’s easy to do, I would make this a priority going forward, and I would go back and adjust some of your best-performing web pages. 19% of description tags were over 160 characters. This wasn’t a huge problem we saw, so it may not be worth noting or mentioning in a sales meeting. This doesn’t seem to be a huge problem on web pages, therefore I would not prioritize this at all. Just make sure you try to communicate your message in 160 characters or less; otherwise, Google could truncate the description tag at around 160 characters, leaving you with a partial message. 67% of web pages had images that were missing alt tags. This is a basic and fundamental part of SEO. If it’s not being done on your potential customer’s web pages, I would point this out. Two-thirds of web pages don’t have alt tags on all their images; therefore; it’s a super easy win for website owners. Google uses alt tags to help them better understand each individual web page. If the majority of your competition is not using all tags on every image, this is a huge opportunity to beat the competition. 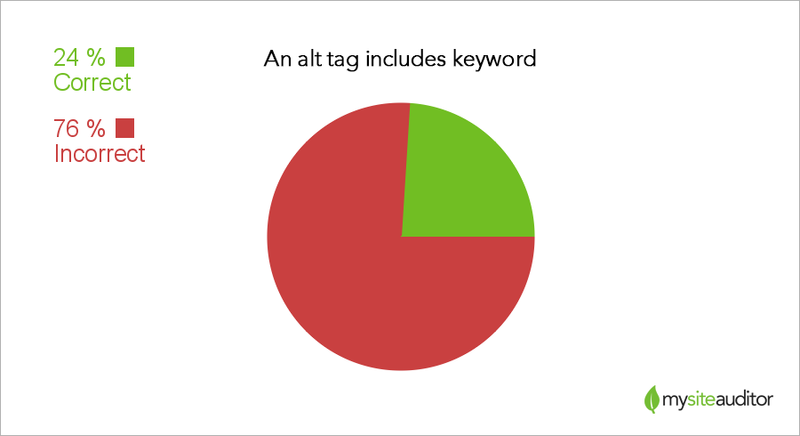 76% of web pages had images that were missing an alt tag with a target keyword. A lot of web pages ignore this simple practice. So it’s definitely worth mentioning this to potential customers. It looks like most people are forgetting to use their target keyword in an alt tag on their web page. This is a huge win for website owners looking to sneak past the competition. 81% web pages had images that were missing an image file name with a target keyword. Chances are, your potential client’s web page made this mistake. I would let the client know that this is a basic SEO practice that needs to be implemented in the future. Unfortunately, this doesn’t surprise me at all. In all the years I’ve been doing SEO, this is one of the signals I see utilized the least. Remember, Google wants to find out everything they can about the content of a web page. Since they can’t see an image, reading the file name (alt tag) is the next best thing. 61% of web pages had an underscore in an image file name. If you see an underscore anywhere, then simply point out that this is not an SEO best practice. Hyphens or dashes should be used to separate words in file names or web page URLs. Google’s algorithm was originally written to read and understand hyphens or dashes, not underscores. Because of that, we always recommend using underscores. If you’re a website owner I recommend fixing this mistake going forward. It’s a very simple, and a very small win for your website. Just keep it at the bottom of your list. Don’t make it a top priority. 31% of web pages were missing an H1 tag. Less than one-third of web pages are missing an H1 tag. Therefore, I would not prioritize this as something I always look for in SEO audits or sales meetings. According to our data most web pages have an H1 tag. So, don’t expect a big win here. Simply make sure you’re using an H1 tag on all of your web pages and try naturally adding your keyword to the H1 tag. 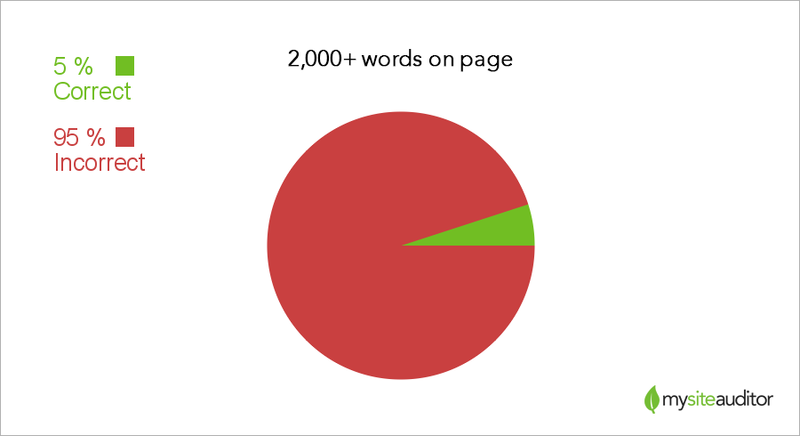 95% of web pages have less than 2,000 words. In my opinion, this is one of the most important signals we looked at. More content always seems to rank higher. That’s not just an opinion, some of the best SEO experts out there agree. Peep Laja, of ConversionXL, said that articles “Between 1,850 to 3,035 words get the most social media shares and backlinks”. A study by serpIQ found a correlation between pages with 2,000 words or more and higher rankings. Glance at a few articles and point out how short they are to potential customers. While very tedious this SEO tactic could be the most impactful thing you do to beat unsuspecting competition. 95% of web pages have less than 2,000 words. The average web page only has 686 words. This is a huge opportunity and a major win for website owners. If you’re trying to rank a web page for a target keyword, this is one of the first things I would do. Just make sure the content has a very high-quality and is thoughtful. Never add content just for the sake of adding content. Think through it and be very strategic. Only 15% of web pages bold, italicize or underline their target keyword. Skim through the first paragraph and look for a target keyword that is bolded, italicized or underlined. If you’re a sales person this is very easy to spot and point out. This is a very easy, but effective win to help propel you ahead of your competition. Only 40% of web pages use their target keyword in the first 100 words. This could be something you point out in sales meetings; however, be careful to add that you are against keyword stuffing. This does help Google better understand the content of your web page, and it’s worth mentioning. Use your target keyword in the first 100 words on your web page because there is a good chance your competition isn’t doing this. It’s a small and simple win for your web page that could help you jump ahead of the competition. 7% web pages still use flash. 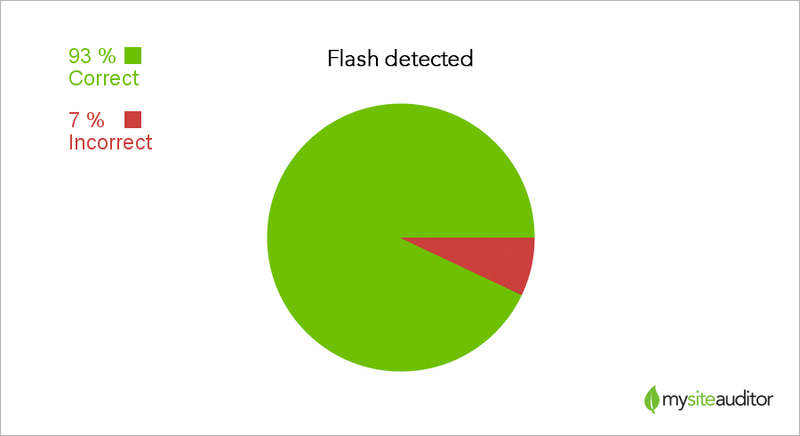 It’s great to see that we only found 7% of web pages using flash. In the unlikely event you find flash on a potential customer’s site, it’s worth mentioning that their website is seriously outdated. I would not worry about this signal too much. Flash is an old technology that is being phased out of existence. Since we only detected flash on 7% of web pages it’s unlikely your competition is using it. 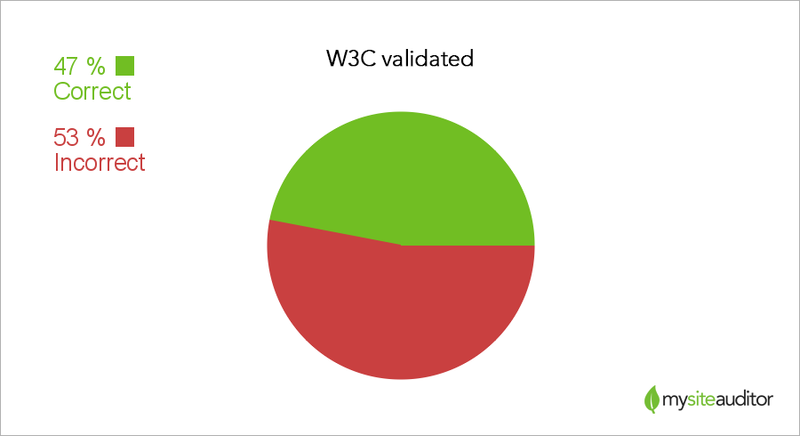 Only 47% of web pages are W3C validated. This is just a sign of lazy or poor coding from your developer. It’s not critical to the success of your potential customer’s website, but it may be worth mentioning. I will let you make the call. If you have a small site it might be worth having your developer clean up the code so it’s W3C validated. However, if you have a large website, I would simply make it a required practice going forward. 89% of web pages have inline CSS. This wasn’t surprising. People are lazy and sometimes don’t code web pages using global best practices. It’s easy to spot in source code, but it’s not really a top priority to mention. Google constantly crawls your web pages so they can connect their users with the best content. Inline CSS makes it more difficult to crawl your pages. Plus, it’s a sloppy coding habit that will cause problems in the future. My recommendation is to fix this and tell your developer to keep all CSS in a separate file or folder on your server. 25% of web pages were missing a mobile sitemap. This is worth mentioning if you see it in the audit. Mobile should be a huge priority for your customer. A mobile sitemap helps search engines quickly identify new mobile-friendly content. If you’re constantly adding new mobile-friendly pages, like on a blog, then I would make creating a dynamic (XML) mobile sitemap a priority. 38% of web pages do not use server compression (e.g., gzip). This may be difficult for a sale person to show in a sales meeting. Therefore, I would not make this a priority to mention, unless your potential customer’s web pages load very slowly. Server compression helps your web page load faster. Because speed does affect your rankings, I would add this to the list of updates to your website. 64% of web pages were missing a viewport meta tag. You can look in your audit report or take a quick peak in the source code to see if the viewport meta tag is there. If not, it may be worth mentioning the importance of mobile optimization to the potential customer. Tell your customer they are missing an essential meta tag that tells browsers how to display the web page on different devices. The viewport meta tag helps browsers properly display your web page on different devices. Because the majority of web pages do not include this in their source code, and because it’s so easy to implement, I would highly recommend adding it to your mobile-friendly web pages. 32% of web pages had a domain with more than 15 characters. Really long domains could be a red flag in the eyes of major search engines like Google. There has been some evidence to show that domains under 15 characters rank better in search engines, but there is nothing conclusive. Therefore, the signal is nice know about, but I would not bring it up in sales meetings. Your domain is your domain. There’s not much you can do about it unless it is brand-new. Otherwise, I would not worry about the signal at all. Only 20% of domains contain the exact keyword. Very rarely will you see a domain contain your potential customer’s target keyword. Google has hinted that they do not use keyword in domains as a ranking signal, but evidence has pointed to the contrary. In all, the signal is worth knowing about, but not worth mentioning. There’s not much you can do if your domain does not contain the target keyword. Do not change your domain unless it is a brand-new domain and you have access to the domain with the exact keyword you are targeting. Other than that, the most you can do is add your target keyword in the page URL after the domain. This is extremely impactful and I would highly recommend doing it ASAP to rock the hell out of your competition. 40% of domains expired in less than one year. Domains that are expiring in less than one year look spammy to search engines like Google. I would recommend telling your potential customer about this in the sales meeting. Even though they can do this themselves for free, it would help strengthen your new relationship with them. This is a simple and easy win. Simply go to your domain registrar and extend the purchase of your domain by at least five years. Only 23% of domains use https. This is a relatively new signal that Google is looking for. It’s easy to look for in any URL, and according to the data the majority of websites still use http. It’s definitely worth mentioning in sales meetings, but it’s nothing I would focus on. The majority of web pages are not doing this yet, so I would recommend using this as an opportunity to get ahead of your competition. This may be a little bit difficult to do because it involves very carefully redirecting your old pages to your new pages. However, I would not put this at the top of my priority list. 80% of domains have a robots.txt file. Not too many domains are missing a robot.txt according to the data. This was not very surprising. It’s a very easy and fundamental SEO necessity to implement. I would not make this a top priority in sales meetings. However, simply going to the domain/robots.txt will show you whether or not they have this file. The majority of your competition has a robots.txt file. Chances are, you have this too. To check, simply go to yourdomain.com/robots.txt. If you do not see it I recommend adding it as soon as possible. 61% of domains do not canonicalize their IP addresses. This is not something you can easily check for unless you have an audit report in front of you. It’s nothing I would bring up a sales meeting. Just let the customer glance at the error. According to this data most IP addresses do not properly redirect to the domain. This is another simple win that will help you get in front of your competition. If you do not know how to do this simply ask your developer. It should take them only minutes to complete. 83% of domains have a favicon. This is a simple signal to look for next to the URL in the address bar. However, I would not add this to the top of my list of “SEO mistakes” to point out. If Google uses this as a ranking signal in their algorithm, it’s probably a very lightweight signal used to help measure the quality of the website and content. Adding a favicon is a simple win; however, I would not add it to the top of my checklist. 17% of domains are missing a favicon, which means your competition probably has one. And if you don’t already have one, you should add one. For the SEO sales people reading this, it’s important not to mention every detail of an audit to a potential customer, unless you enjoy watching them fall asleep. Point out the more serious mistakes and skim over the rest. If you’re a website owner, I would make a checklist of everything you need to do and knock out the smallest wins first. I’ve gotten so many web pages to page #1 of Google without even thinking about earning backlinks, and I did so with small SEO wins like the ones I mentioned above. I would say, “good luck”, but if you follow my advice you won’t need it. So… take care my friends.